The Air Quality Partnership of Delaware is on Facebook! Be sure to “like” us on social media! 2019 Air Quality Awareness Week! The Air Quality Partnership (AQP) of Delaware is pleased to announce 2019 Delaware Air Quality Awareness Week is from April 8th – 12, 2019. The Partnership, which includes RideShare Delaware, DART First State, Dover/Kent MPO, Chesapeake Utilities, WILMAPCO, and many others is encouraging clean modes of travel to work, such as carpooling, public transit, bicycling, walking, or telecommuting. 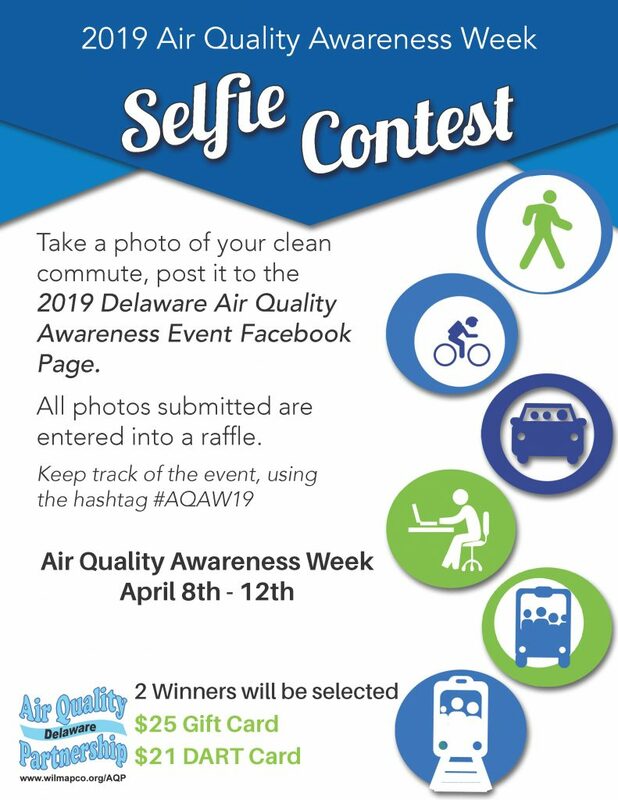 Take a photo of your clean commute, post it to the 2019 Delaware Air Quality Awareness Facebook page and use the hashtag #AQAW19, to be entered to win a DART transit pass or a gift card! Tropo, the mascot of the Air Quality Partnership, will participate in Wilmington’s Earth Day promoting “Try It Day Delaware” with a series of videos. The videos, featuring Tropo trying cleaner transportation options, can be viewed on the Air Quality Partnership’s Facebook page throughout Air Quality Awareness Week. Elected officials including Senator Thomas Carper will join Tropo in trying greener commuting options throughout the week. An Air Quality Champion award will be presented to local businesses making efforts to encourage employees to make greener transportation choices, or taking other measures to improve air quality and raise awareness of air quality matters. To signup to for notifications of Air Quality Action Days, when the ozone or PM2.5 levels are expected to reach unhealthy levels, please visit: www.enviroflash.info. The Air Quality Partnership is pleased to announce the arrival of Tropo of the Planet Sora. Tropo, a new friend of the AQP and Delaware, is here to help raise awareness of how the air we breathe affects our health and how the things we do can impact the air we breathe. 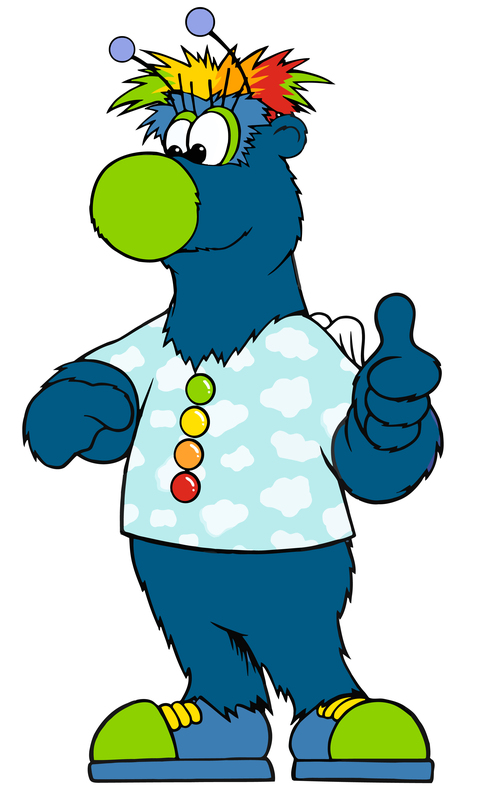 Tropo, a six-foot tall mascot, helps children and adults understand that simple steps, including: carpooling, walking, biking, taking public transit, and turning off the car engine when you stop for more than two minutes, can make a big difference to help reduce air pollution. Interested in Tropo visiting your school or event? Click here! On AIR QUALITY ACTION DAYS we urge you to limit your time outdoors during the afternoon, when ozone is typically at its highest levels. On these days, don’t fill up your gas tank until after sunset, don’t mow your lawn or use a BBQ grill and limit the use of your car – carpool, bring your lunch to work, ride transit, etc. “Trip-link”: do all errands at one time, avoiding unnecessary cold starts. An engine that’s been sitting for an hour or more pollutes five times as much as a warm one. Don’t “top off” your fuel tank. This is never a good idea, no matter what time of day. Spillage adds about two tons of pollution a day to our air. Turn off your engine when you stop your car for a minute or more. Postpone mowing the lawn until late in the day or use a manual or electric mower instead. (And remember to refuel mowers and other gasoline-powered tools after dusk too). Start your barbecue with an electric probe, charcoal “chimney” or use a gas grill. Charcoal lighter fluid vaporizes quickly and adds to air pollution. Use latex paints -rather than oil-based-and avoid daytime use of pollutants. The mission of the Air Quality Partnership of Delaware, a public / private coalition of businesses, agencies, and individuals interested in clean air, is to raise awareness and inform Delawareans about practices that improve air quality and citizen health. Ground level ozone and particulate matter (PM 2.5) are both caused by pollutants in the air, frequently the result of vehicle or industrial emissions. They can result in health problems, particularly for sensitive groups, such as seniors, children and people with respiratory problems. You or your organization can play an important role in reducing the impact of poor air quality by working with us to educate Delawareans about simple steps that can be taken to “Do Their Share for Cleaner Air.” These steps, when taken by many people, reduce the incidence of high ozone days, resulting in a reduction in lung-related illnesses, lower health care costs, reduced employee absenteeism, and families that are happier and healthier. For more information, please contact Randi Novakoff at 302-737-6205 ext. 111 or email rnovakoff@wilmapco.org. Ground level ozone, or smog, is air pollution that is particularly dangerous on hot summer days. It is caused by emissions from cars and other gasoline engines combining with sunlight and heat. On days when the temperature is high and the air is still, these emissions (NOx and VOCs) create a harmful mix called ground level ozone. It can affect everyone. The average adult breathes over 3,000 gallons of air every day. Children breathe even more air per pound of body weight and are more susceptible to air pollution. Also, they play outside more and are exposed to greater quantities, compared to adults. Groups especially sensitive to air pollution include: children, the elderly, people with heart and lung diseases, and in the summer, adults who exercise or work outside. In the short-term, exposure to high levels of ozone irritates the lung’s airways and causes inflammation, much like a sunburn. Other symptoms include coughing, wheezing, chest pain and headaches. It can aggravate chronic respiratory diseases such as asthma and bronchitis and can lead to increased emergency room visits and hospital admissions. Long-term, prolonged exposure to even low levels of ozone can cause asthma in children and lead to permanent lung damage. To help you know if the air outside is safe, we forecast air quality every day from May-September. Watch the news, visit our website or check your local newspaper to see what the Ozone level is each day. GREEN Good No health impacts expected. YELLOW Moderate Unusually sensitive people should consider avoiding prolonged outdoor activity. ORANGE Unhealthy for Sensitive Groups For Ozone: Sensitive groups (including children, the elderly, persons with respiratory conditions and adults who exert themselves or work outdoors) should limit outdoor activity. For Particle Pollution: Sensitive groups (including children, the elderly, persons with respiratory AND heart conditions) limit their outdoor AND indoor activity. RED Unhealthy For Ozone: Everyone should avoid prolonged outdoor exertion. For Particle Pollution: Everyone should avoid prolonged outdoor AND indoor exertion. Particulate Matter refers to tiny particles that are emitted into the air. Our region was determined to be in non-attainment for Particulate Matter 2.5 (PM2.5). This means, the particles are 2.5 microns, about 1/14 the width of a human hair. Because they are so small, they get imbedded into the lining of our lungs and cause health problems. Unlike ozone, PM2.5 levels don’t rely on sunlight to create unhealthy air. Therefore reach dangerous levels any time during the day and all year round. In addition to respiratory problems, exposure to PM can cause cardio damage as well.